4-square array monopoles for 40m, very good ground. Four vertical monopoles are arranged in a square and separated by a quarter wavelength. The antennas can be fed in a number of ways. Generally the front antenna is fed at 180 degrees in relation to the rear antenna, and the two side antennas are fed at 90 degrees in relation to the rear antenna. This results in a radiation pattern in just one quadrant of the compass (and a small rear lobe), with around 6dB of gain over a single vertical and 25dB front-to-back ratio. Beamwidth is about 80 degrees at the three dB points. A switching system means that the beam can be rotated quickly between the four points of the compass. In New Zealand the centre of the beams would be aligned to NW, NE, SW, and SE. Phasing requires a 90 degree phase shifter and a 180 degree phase shifter. This can be achieved in a number of ways. Commercially, all circuits now use hybrid couplers and a toroidal 180 degree transformer. The antennas are fed from the phasing unit to the antennas with ¼ wave 75 ohm coax, to achieve “current forcing” of the antennas. Again it is possible to use the Christman method with two specifically calculated phasing lines or variable delay line boxes and a 180 coaxial delay line or transformer. 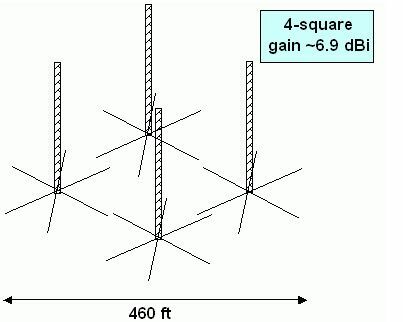 Coaxial delay lines can be quite long at 40m and below, and this tends to suggest the Christman method is better suited to the higher bands from 30m and above where other antenna systems may prevail.